While your child is unwrapping gifts at a party, it can sometimes be difficult to hold the attention of all the little guests. Of course the birthday party is all about the birthday boy or girl, but it is a fun idea to involve the guests in a silly game while opening gifts. Here are some fun gift opening games that will help keep the guests entertained. As the guests arrive to the party, use a marker to write a number on each gift. Before it’s time to open gifts, give each child a piece of paper and have them look at each of the gifts to try to guess what’s inside. Have them write down their answers. As your child opens his gifts, the guests can see how accurate their guesses were. The guest with the most correct guesses could be awarded a prize. This is a fun game for everyone and it’s one of the easiest gift opening games to set up. Before the party, you could create a simple Gift Bingo card with items like: something yellow, something that uses 4 batteries, something for outdoor play, something with “exciting” written on the package, something that could be used in the water, something that a pet may like playing with, something that you have at home, etc. Guests will have to pay close attention to each of the gifts and see if they can be used to mark off a square on their bingo card. Attach a letter to each gift and as each gift is open, the kids can collect these letters. After all the gifts are open the kids can unscramble these letters to make a word which will lead them to a hidden prize location. While the kids are busy playing party games, you could hide each gift around the party area along with a clue. 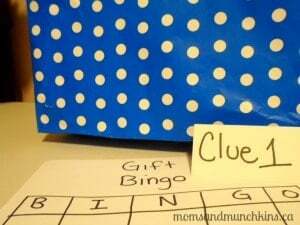 You can then provide the guests with their first clue to the first hidden gift (which the birthday child can open along the way) and use the next clue to find the next gift. It’s kind of like a fun scavenger hunt for birthday gifts. Do you have any fun gift opening games to share? Does your child open his gifts at the party or do you wait until after the party? If you’re looking for adorable party supplies, check out one of my favorites – Birthday in a Box and save 10% off on all orders over $50 – Use code BDAY10 (a Moms & Munchkins affiliate code). To stay updated on our latest ideas for parties, follow us on Facebook, Twitter, Pinterest and Bloglovin’.